Excellent Fine Dining SteakhouseMy husband got the lobster bisque which was extremely good. Best special occasion restaurant in ft WayneGreat place for special occasions and for romantic dinner, although not private. prince island edward mussels steamed in a lemon rass-ginger broth; garnished with scallions, roasted red peppers, and a garlic crostini. blue crab, smoked gouda cheese, roasted red peppers, and baby spinach baked in a bread boule and served with pita chips. served with a spring mix atop our sweet and sour sauce garnished with candied walnuts and bleu cheese crumbles. baked with‏ port wine poached button mushrooms and a stilton bleu cheese garlic butter; served with a garlic crostini. toasted ciabatta bread topped with a goat cheese olive tapenade, roma tomatoes, basil, and fresh mozzarella cheese. 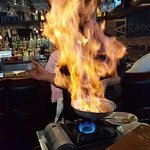 bacon wrapped jumbo prawns seared and glazed with spicy kansas city barbecue sauce; served with fried green tomatoes and jalapeno coleslaw. chilled jumbo shrimp served with a housemade cocktail sauce. 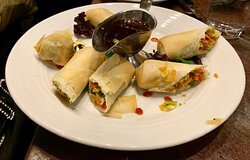 filled with asian vegetables and lightly fried, served with asian glaze and sriracha. sesame-crusted ahi tuna, seared medium rare, with wasabi, ginger, sriracha, soy sauce, and spicy cucumber salad. crisp baby iceberg lettuce with pomodoraccio tomatoes, smoked bacon, red onions, candied walnuts, croutons, and a creamy buttermilk bleu cheese dressing. mixed lettuces chopped with tomatoes, cucumbers, red onions, eggs, smoked bacon, and white cheddar tossed with our house dressing and served with a toasted garlic crostini. romaine lettuce tossed with parmesan cheese, black pepper, and housemade croutons in traditional caesar dressing. chopped romaine lettuce, kalamata and green olives, diced beets, pepperoncini, red onions, feta cheese, and tomatoes. served with red wine vinaigrette. your choice of bleu cheese or mozzarella, finished with balsamic drizzle and fresh basil. fresh spinach, candied walnuts, strawberries, red onions, and aged balsamic vinaigrette. 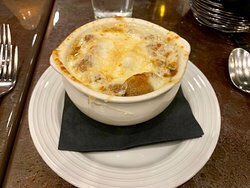 six onion soup topped with provolone cheese. bakerstreet's signature soup. rich and creamy. dos equis beer battered and paired with haricot verts and fingerling potatoes; served with smoked jalapeno tartar. applewood smoked chicken, andouille sausage, and jumbo prawns; tossed with onions, sweet peppers, wild rice, and stewed chorizo-tomato sauce. gently roasted half chicken served over garden vegetables and almond cous cous; finished with jalapeno-tomatillo sauce and topped with a jicama relish. cous cous with golden raisins, apricots, and toasted almonds topped with moroccan spiced zucchini, yellow squash, fingerling potatoes, and sweet cherry tomatoes. 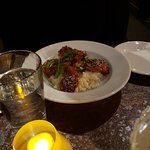 scottish salmon oven roasted in an asian glaze served with wild rice and stir-fried vegetables, finished with a teriyaki aioli. sauteed with capers in a tomato beurre blanc; served with asiago stuffed gnocchi and steamed asparagus. a full pound served with drawn butter. ravioli stuffed with butternut squash and autumn spices; tossed with spiced walnuts, dried cherries, and parmesan in a brown butter basil sauce; finished with a balsamic reduction. sashimi grade tuna, seared rare, with char-grilled romaine, red onions, tomatoes, extra virgin olive oil, and a balsamic reduction. 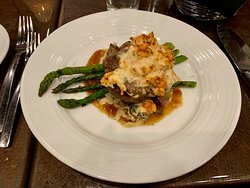 served with your choice of baked potato, whipped potatoes, broccoli, or asparagus. 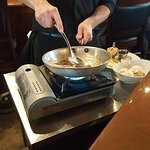 served with‏ your choice of baked potato, whipped potatoes, broccoli, or asparagus. bacon-wrapped and char-broiled with a sweet dijon hollandaise; served with creamed spinach. white marble farms tenderloin brined with bell's two hearted ale, served with a spicy chorizo hash, and finished with a balsamic glaze and kansas city barbecue sauce. 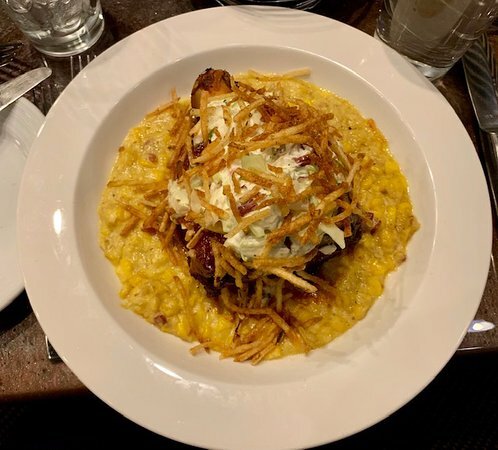 whiskey glazed, served over loaded and smashed potatoes, and topped with tabasco spiked onion straws. 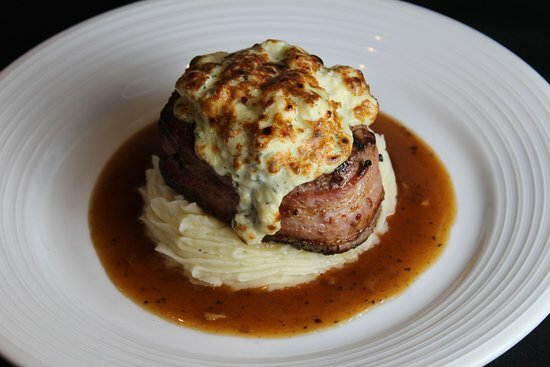 bacon-wrapped and topped with a feta-stilton glaze then served over bordelaise; served with whipped potatoes. creole spiced and pan seared, served with bacon marmalade brussels sprouts and pommes frites; finished with a red wine sauce meuniere. served over bordelaise and bèarnaise, crowned with lobster and asparagus, served with wild mushrooms. 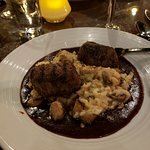 a pair of three ounce filet medallions dusted with our coffee steak rub and served over a bleu cheese and walnut risotto; finished with a port wine reduction glaze. we invite you to make it your own! baker's dozen with chef's carmalized glaze. mixed greens served with grilled seasonal vegetables, potato wedges, filet tips, white cheddar, and house dressing. spicy jalapeno-cilantro pulled pork with ham, pickles, mustard, mayonnaise, swiss cheese, and house seasonings on pressed ciabatta bread. hand breaded and lightly fried with bacon and swiss cheese, and a spicy buffalo sauce on a brioche bun. 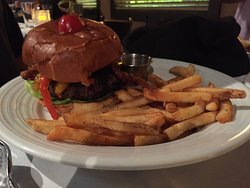 BakerStreet is a locally owned establishment that prides itself on personalized service. An upscale, elegant decor complements the polished, casual attitude. Steaks are the specialty at BakerStreet. Whether traditional and classic, or edgy and gourmet, all the bases are covered. Fresh seafood features are added weekly to the favorites on the menu. Even the vegetarian will find something special at BakerStreet. Chef Kyle's dessert offerings will bring the perfect finish to your dining experience. BakerStreet offers a diverse wine list, with many half bottles and “by the glass” options, and an extensive craft beer list! Come in and enjoy! Don’t forget to ask about the private party rooms. Total enjoyable from taste of food to service very nice . Very happy with experience and good time with friends. Thank you for your review and five star rating! We are happy we could help make time with friends more enjoyable! We hope to serve you again soon! Thank you for taking the time to leave us a review. We are pleased to see that you had an enjoyable experience. We look forward to providing you with a great experience again soon! 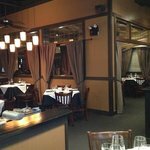 Great Dining Experience in Fort Wayne! Been here twice and LOVED it both time! Great atmosphere, staff & food. A bit pricy but really, really good! Get quick answers from BakerStreet staff and past visitors.